With many shop-floor measurement options available in today’s marketplace, understanding the technology differences and the impact they have on performance before selecting a system. 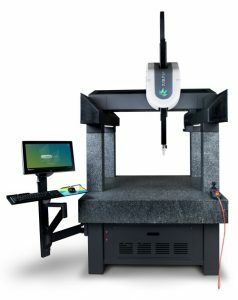 Sea Chiahui, regional product manager – stationary at Hexagon Manufacturing Asia Pacific gives an insight into the operating principles behind its 4.5.4 SF and 7.10.7 SF coordinate measuring machines. The promise of efficiency savings are making shop-floor measuring systems an increasingly attractive proposition for manufacturers. But, like any quality control or manufacturing technology, there is a great diversity of product offering, and the different operating principles can be confusing for businesses looking to acquire new equipment. Even within the Hexagon range, there are multiple approaches to the challenges of shop-floor metrology, and knowing which is best for a particular installation is key for ensuring return on investment. 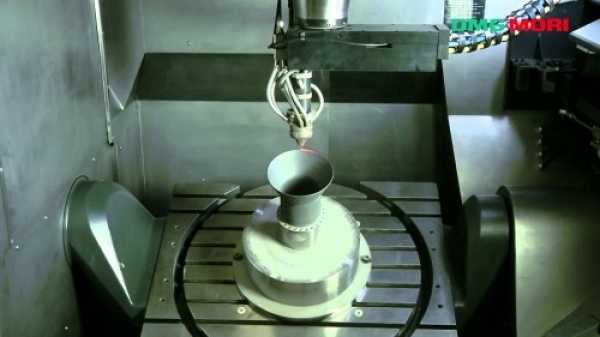 Coordinate measuring machine (CMM) accuracy is dependent upon the ambient thermal environment in which it operates. Changes in temperature cause the scales, machine structure and artefacts being measured to expand, contract, and, in some cases, distort in a non-linear manner. 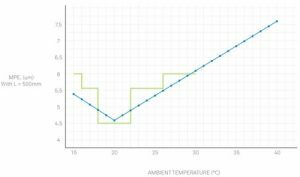 Though often compensated for in a variety of ways, these thermally-induced changes can lead to significant measurement uncertainty, particularly in the context of measurement on the shop floor, where temperature can be difficult to control. With the ever-continuing trend of moving dimensional inspection from thermally controlled metrology labs to the shop floor, understanding how temperature affects CMM accuracy is more important than ever before. where E0, MPE is in microns, and L is the measurement length in millimetres. While this is a logical way (for both the CMM manufacturer and the customer) to specify the temperature dependence of CMM accuracy for a machine in a lab environment, the logic falls apart for machines installed and used in an environment where the temperature is not well controlled over both long and short timescales. While a single temperature band specification (whether it is wide or narrow) is convenient for the CMM manufacturer, the customer is left with only the manufacturer’s conservative, but not terribly detailed estimate of how machine accuracy changes with temperature. After all, a primary reason that customers purchase a shop-floor machine is to position it in a location where the ambient temperature will, in all likelihood, affect the CMM’s measurement accuracy. 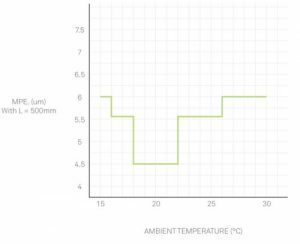 With a measuring length L of 500 mm, this is portrayed graphically as a step function of ambient temperature. Considering the physics involved when metrology frames expand, contract and distort with changes in temperature, we intuitively know that this type of step function is inaccurate. Metrology structures do not normally exhibit changes in accuracy as a step function of temperature, with instantaneous degradations in accuracy occurring when the temperature crosses some threshold value. Or, if they did exist, we probably would not want to make measurements with them. Metrology structures do not normally exhibit changes in accuracy as a step function of temperature, with instantaneous degradations in accuracy occurring when the temperature crosses some threshold value. Clearly, a more detailed description of CMM accuracy under varying ambient temperature conditions is needed in environments that lack sufficient thermal controls. A more physically realistic alternative is the specification of accuracy as a continuous function of ambient temperature. And from the pragmatic viewpoint of the metrologist or quality engineer, it is eminently more useful. where ?T is the departure of ambient temperature from 20°C. Again, let’s consider a measuring length of 500 mm and plot E0, MPE as a function of ambient temperature. This time we find a more physically intuitive result and one that is much more useful to the metrology practitioner. The usefulness is further demonstrated when we display on the same graph the previous hypothetical example where performance was specified over a series of broad thermal ranges. 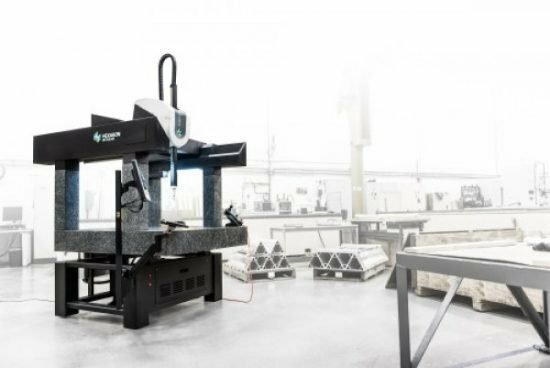 In addition to providing the user with a more precise picture of the CMM’s accuracy at varying temperatures, a continuous specification is a compact and elegant way of defining machine accuracy specifications and is particularly well suited to being incorporated into automated reporting of measurement results. Another factor to take into consideration when one is equipped with an extended temperature range specification, continuous or not, is the permissible temperature changes that the manufacturer specifies over time. Normally this is expressed as the change within a one hour and a 24 hour period. This specification tells the user how much temperature variation is allowed over a given time interval in order to maintain the specified accuracy performance. A larger permitted change in a given period means the machine is better able to cope with changing workshop thermal conditions. When choosing to deploy a CMM on the shop floor, it is important to evaluate the measurement tasks to be performed and calculate an uncertainty budget. Then, calculate the accuracy of the machine using a continuous thermal specification at all of the different temperatures that your shop may encounter, making sure that you do not exceed the total thermal variation per hour or per day. This gives you the expected accuracy of the machine at any time of the day. If the machine accuracy is acceptable to your uncertainty budget at all times, great – you can use your machine all day long. 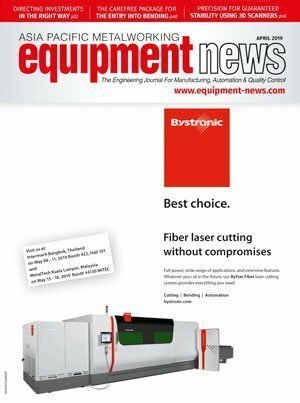 If not, then you must consider alternatives, such as only using the machine at certain times of the day, or running parts with looser tolerances during times when the shop is warmest. The use of a CMM with a continuous thermal specification on the shop floor equips the operator with a more complete picture of a machine’s expected performance in an uncontrolled environment. This enables better decision making and more confidence in measurement results. Where additive manufacturing is concerned the integral combination of building up material with the aid of a laser and machining is essential. 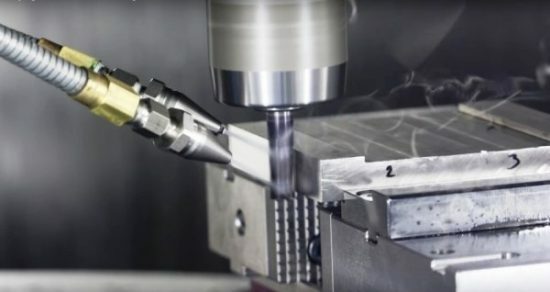 DMG Mori has promised what they coin as “unlimited degrees of freedom” in construction and at the same time precision and surface qualities from this combination.